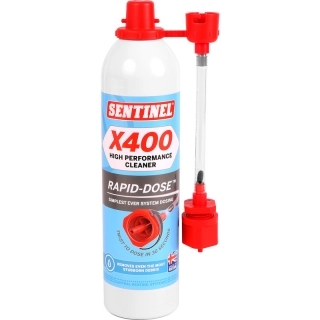 Sentinel X400 Rapid-Dose Sludge Remover at PlumbNation is the brand new system designed to make the dosing of Sentinel's tried and tested performance water treatments chemicals into a central heating system quick, clean and easy. Sentinel X400 Rapid-Dose Sludge Remover is a ruthlessly efficient way to eliminate the build-up of magnetite sludge, and is the quick and easy way to eliminate cold spots and restore full heat emission. Sentinel X400 Rapid-Dose discharges the contents of the can into the system in seconds. One 400ml can is sufficient to treat a normal domestic system and there is no need to drain or depressurise the system. Sentinel X400 Propellant is simply compressed air and the used can is all fully recyclable using local recycling facilities where they are available.